Those breeders who have been involved in Wolfhounds for many years will remember rhinitis being a common condition during the 1970s. In fact, known cases of the disease have occurred in many countries in both hemispheres. The term rhinitis actually means 'inflammation of the nose' and describes more accurately the manifestation of the condition - but the disease itself is called Primary Ciliary Dyskinesia or PCD for short. A devastating condition where symptoms are seen in puppies. They have copious, sticky nasal discharge within a few days of birth. They soon develop a moist cough and recurrent chest infections. Typically, the infection seems to clear up with antibiotics, but soon recurs. Puppies severely affected usually do not live past their first year, but the disease has several levels of severity. Longevity and quality of life depend on that level and the care given to the affected animal. Adult dogs living with the condition will continue to have the same copious nasal discharge, yellow and string like, throughout their lives and also fight repeated bouts of pneumonia, and although the condition is managed by ongoing antibiotic therapy and aggressive treatment of the pneumonia, it is the pneumonia which ultimately brings about the end of life. Although PCD is often thought to have disappeared along with the 1970s, this is not the case. Since then cases have occurred internationally (Australia, Canada, continental Europe, New Zealand and the US) in an almost cyclical manner, even as recently as 2011 here in the UK. Given that this condition is thought to be an autosomal recessive mode of inheritance (i.e. both parents must carry the gene), it might be a good time to have a closer look at exactly what PCD is and what causes it. Wolfhound rhinitis is a disease that mainly affects the respiratory tract, i.e. the nasal passages and the lungs. In the Irish Wolfhound this syndrome was first described in the 1960s but has been mentioned in the literature infrequently since then. However, we have recently become aware of an increased number of cases both in the United States and Europe. In a collaborative effort between Dr. Iris Reichler at the University of Zürich in Switzerland and ourselves at the University of Pennsylvania, we have begun collecting data and blood samples from affected dogs, their healthy littermates and their parents. We have strong evidence that Wolfhound rhinitis is due to a malfunction of the cilia, which are microscopically small hair-like structures that line the airway passages (nose, sinuses, trachea, and lungs) and beat in an organized manner. The cilia are responsible for the transport of particles such as dust, dirt and microbes out of the lungs. If the cilia are absent or do not beat in a synchronized fashion, the particles become trapped in the airways. The result is chronic respiratory infections leading to bronchitis and pneumonia. The common clinical signs are sniffling, sneezing, clear to greenish nasal discharge (=rhinitis, hence the name), and coughing. It is important to realize that rhinitis is just a symptom and is not the cause of disease. Affected dogs may develop fevers when the infections get worse. 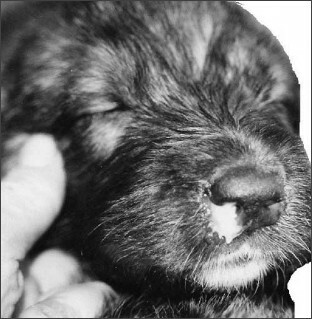 Dogs may show signs at birth already (runny noses) or not until later in life (6 months to one year). In general, dogs and humans with this condition can live quite long if they are maintained on antibiotics. Their lungs need to be cared for by frequent inhalation of steam and coupage (patting the affected dog on the side of the chest for several minutes on each side) which help loosen any mucus that is stuck in the deeper airways. For many years there has been a debate whether this is truly a disease of malfunctioning cilia or if a defective immune system causes Wolfhound rhinitis. The main reason why Wolfhound rhinitis was thought to be caused by an immune defect is because, in the past, the immune systems of affected dogs were always examined during phases of severe illness; the immune system is never normal in very sick or dying individuals. For our studies, we treated the affected dogs and waited until they were clinically healthy to examine their immune system. After an exhaustive examination and comparison of the immune system of affected dogs and their normal littermates, we found no differences. Our results suggest that Wolfhound rhinitis is not caused by an immune system defect. We have also looked at the cilia under the microscope and have determined that the cilia do not move correctly. Further examination under the electron microscope revealed abnormal structure of the cilia. These findings suggest that Wolfhound rhinitis is caused by abnormal ciliary function. Interestingly, a small proportion of the affected Irish Wolfhounds in Europe also had hydrocephalus. Hydrocephalus is the abnormal buildup of cerebrospinal fluid in the ventricles (cavities) of the brain. The form of hydrocephalus seen in the Irish Wolfhound does not cause any clinical signs and does not impair the dog's quality of life. However, there are forms of PCD in humans that are also associated with hydrocephalus (the cilia are also responsible for moving the cerebrospinal fluid in the brain). This observation strengthens the hypothesis that we are truly dealing with PCD in the Irish Wolfhound and not as previously suggested an immune disease. For the breeder it is most important to know the mode of inheritance in order to avoid producing affected puppies. Careful analysis of the pedigrees from Irish Wolfhounds with PCD indicates that it is an autosomal recessive disease. This means that an affected dog must have two defective genes in order to show signs of disease, both male and females can be equally affected, and the parents can look completely normal. The figure below shows the mode of inheritance as an example. This drawing shows a situation where an accidental brother-sister mating occurred. All genes are present in pairs in each individual, except for those genes on the X and Y chromosome. Each parent passes one of its two copies of a gene to an offspring and there is basically a 50:50 chance, which of the genes from each parent gets passed on. In the example above, we will look at only one particular gene - let's say the PCD gene. "A" stands for the normal copy of the gene and "a" stands for the defective or mutated copy of the PCD gene. The checkerboard-square demonstrates the possible combinations if both parents were "carriers". 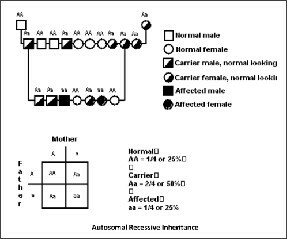 In autosomal recessive traits, such as PCD, carriers (Aa) "carry" the defective gene (a), but they also have a normal one (A), which allows them to be healthy. The checkerboard shows that there is - statistically - a 25% chance of having completely normal offspring, a 50% chance of having carriers, and a 25% chance of having affected dogs. The top of the pedigree above shows the first mating between two unrelated parents, one being a carrier and the other one normal. Remember that both of these parents look normal and do not show signs of disease (i.e. there was no way of knowing the mother was a carrier). If you were to do the "checkerboard" math again, you would see that a mating between AA and Aa would result in 50% AA and 50% Aa offspring. The second breeding in this pedigree was a carrier-brother X carrier-sister mating resulting in normal, carrier, and affected puppies. While the affected pups will be easy to recognize, the carrier and normal dogs cannot be distinguished just by looking at them. This is demonstrated in the drawing by the open symbols and the AA or Aa above each symbol. It is important to remember that when assessing risk analysis percentages that the influence of ancestors is cumulative. Currently, there is no reasonable way to distinguish carriers from normal dogs, as they look the same. To eliminate PCD from the breeding population, a DNA-based test would be extremely valuable. At this time, the only way to know if potential parents are carriers is by having affected pups born (both parents are automatically carriers) or if a test mating was done by breeding the parent in question to a known carrier. If more than 11 normal pups are born, then the prospective parent is most likely not a carrier. However, this is a very crude method of "genetic testing". Currently, we are trying to find the gene for PCD and subsequently develop a DNA-based test for the disease. To perform these investigations, we are requesting blood samples from normal and affected dogs to extract DNA. Five - 10 ml of EDTA blood (purple top tube) should be sufficient. The blood may be sent on ice packs or at room temperature, but not frozen. Please include basic pedigree information (both registered and call (pet) names, gender, parents, and date of birth) and remit the signed consent form (available on the Study page). The samples should be sent to the address below. Further information and updates on the PCD study can be found on the IW Foundation web site. There are some dogs that require maintenance antibiotics all the time. These dogs may be kept on first generation cephalosporins or Clavamox for maintenance. Third generation cephalosporins, or azithromycin (Zithromax), are reserved for acute infections with clinical signs. Occasionally, resistance to some of these antibiotics develops, and it may be necessary to change to a combination of enrofloxicin (Baytril) and ampicillin. Doses should be determined by your veterinarian. Zithromax 5-10 mg/kg. To prevent nausea from the Zithromax, the first day's dosage is 5mg/kg, then increase the dose to 10mg/kg from the second day on. Continue the high dosage amount of Zithromax until 5 days after the last clinical signs have disappeared. can be found on the Irish Wolfhound Foundation website.